The retreat centre was founded by HE Rigzin Dorjee Ripoche in 2014 and initiated by H.H Jadral Sangay Dorjee who also bestowed the name WOED-SAL LHUN-DRUB-LING Retreat Centre. Rinpoche chose the spot because it was splendidly adorned with all the qualities of solitude, and also was blessed by many holy beings throughout the ages. The well-furnished C-block temple, designed according to modern architecture, accommodates ten(10) retreatants. The retreat centre offers bright, cheerful, and well-ventilated rooms for each practitioner along with modern amenities such as bathrooms, refectories and an assembly hall for special ritual performances. Only vegetarian food is permitted. Within the three-year and three-month course, the practitioners undergo rigorous training from the basic preliminaries practices, Rigzin Sogdrub (practices) During retreat, there are four compulsory mediation sessions per day, and pujas are conducted on the auspicious days. The retreat centre was founded by HE Rigzin Dorjee Ripoche in 2001 and initiated by H.H Jadral Sangay Dorjee who also bestowed the name Theck-Tse Mindrol Samten Choeling Retreat Centre. Rinpoche chose the spot because it was splendidly adorned with all the qualities of solitude, and also was blessed by many holy beings throughout the ages including Yogi Ugyen Ninda Tenzin who attained the common and supreme siddhis (accomplishment) there. The well-furnished three-storied temple, designed according to modern architecture, accommodates sixteen retreatants. The retreat centre offers bright, cheerful, and well-ventilated rooms for each practitioner along with modern amenities such as bathrooms, refectories and an assembly hall for special ritual performances. Only vegetarian food is permitted. Within the three-year and three-month course, the practitioners undergo rigorous training from the basic preliminaries practices, Sadhana (practices) for the three roots (Guru, Deva, and Dakini), meditation on the body’s energy channels, their energies and essences and finally the Dzogchen (ultimate Wisdom Threk-chod and Thod-gal practices). During retreat, there are four compulsory mediation sessions per day, and pujas are conducted on the auspicious days. 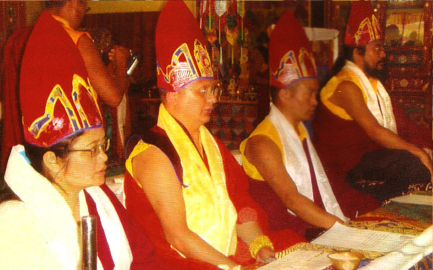 After having successfully completing the course, the best and most qualified practitioners are formally conferred the title of Vajra Acharya and awarded the hat by Rinpoche. They can then go on to choose any role according to their own interest and abilities – such as offering spiritual guidance; becoming meditation masters, Vajramasters, and lineage holders; continuing their practice in retreat, and so on in order to benefit multifarious beings. We should dedicate our lives to a good cause by preserving and propagating the Buddha Dharma throughout the universe in order to fulfil the dreams and wishes of our Root Guru. 3. Perfection practice on channel, energy and essence. 4. Great Perfection practice, the nature of the mind. Dorje Loppon means Master of Vajrayana Buddhism. Dorje Loppons have perfect knowledge of meditation on visualization, perfection and great perfection of the Vajrayana Buddhist school.